So now I am confused. I have connected everything together. 6V power supply 1A, 1 x Servo to GPIO4, I have the servoblaster char file in /dev and in /dev/procs with an id of 251, however when I run the command "echo 0=12 > /dev/servoblaster" and I have tried 0 - 7 in the command I do not get any movement on my servo... What am I missing. Dare I ask, have you loaded the driver? And check it's there using "lsmod"
Can you take a picture of your wiring and post it somewhere for us to see? Do you have access to any test equipment, such as a multimeter or an oscilloscope? 5. Issue "sed -n 's/ servoblaster//p' /proc/device"
6. Issue "mknod -m 0666 /dev/servoblaster c 251 0"
7. Issue "echo 0=150 > /dev/servoblaster"
..and my servo twitched into life. It's on GPIO4 (pin 7) and GND (pin 9). I'd be happy to shut it all down and redo it to check the sequence of events. Lastly, "12" is a rather low number (is it a typo?). The servo might be hitting its end stop. Try "echo 0=150 > /dev/servoblaster". This should give you 1500us or 1.5ms, which is the nominal mid-point of a servo's range. It's not clear from your post as to whether you have got it working or not. Have you connected the servo ground to the Pi's ground as well as the ground of the power source? Ok, so I started fresh on my Pi and now it works. I must have had a hardware addressing conflict somewhere in linux. One of my servos has a low limit of 610us, below which it goes a little mad. I am not sure what the high limit is because I can only write 2490us. I have the feeling it will accept pulses a little higher, so I'd like to try. I will try the new driver later (not until Wednesday I am afraid). rgh wrote: I don't know why only one person apparently had that issue but if you can get a 'scope on the GPIO pin you should see a 1.2ms pulse repeating every 20ms. If you see something other than that, let us know. Unfortunately I'm a long way from Hull or I'd happily call round to give you a hand. While trying to solve the problems I have been having I pot a scope on the GPIO and did get some discrepancies with the timings. Thanks! I just tried it. Indeed I can write larger values to /dev/servoblaster and my servo will travel a little further. One goes slightly mad at the high end at 2580us, the other at 2530us. I agree that values of > 300 would be generally useless, and in fact a limit of 250 (or 249) is entirely reasonable. Four of my servos have a maximum value which is much less than 250. The other two are barely useful beyond that limit. One thing I noticed: With num_servos set to 2 I occasionally get long pauses when writing to /dev/servoblaster. This is quite rare, but never happens when num_servos is not specified. connected it to the IO-pins that the kernel-module use. Did you typo the error message above, or did it really say "errot neat" rather than "error near"? 'wc' shows the number of lines, words, and characters in my file, 'md5sum' shows a sort of checksum for the file content. Do you get the same wc and md5sum, output for your file? I don't have any blank lines at the end of my file btw, the last line is "done". I didn't try to run the script this time, but when it was first posted I copy and pasted it and it ran ok. If your md5sum is different and you can't figure out what is going on, you could run "od -x /usr/local/bin/sbcontrol" and sending me the output in a private message. I have been getting exactly the same error. My values for wc and md5sum were way out. I figured it was possibly a problem with the copying of the text. I downloaded a copy of Notepad++ and copied the text to that and saved it as a txt file. I then transfered it to the RPi on a USB thumb drive and copied and pasted it into nano and saved it. WC and md5sum were identical to yours and the file gave no errors. There is probably a simplier and more elegant way to do it but this worked for me. This explains the problem with cutting and pasting code from the forum: http://www.raspberrypi.org/phpBB3/viewt ... sp#p204341. In the next post on that thread joan has a suggestion for using 'tr' to strip the problem characters. I just discovered a nifty way to use servoblaster over a wireless (or wired) network link. Both computers need to be on the same network. Keep in mind that I have "robotcontroller" and "controlstation" defined in my hosts file with the static ip addresses of my two Pis. The second command activates netcat in listen mode, listening to port 5000 and sending any input to servoblaster. 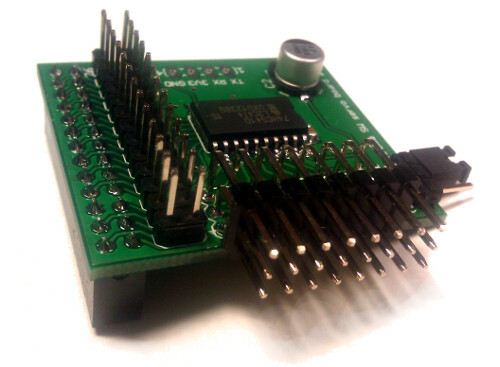 This activates netcat and sends any typed input directly to port 5000 on robotcontroller. This series of commands moves servo number 1. When finished, hit crtl-c on each machine to stop netcat. You can now "cat /dev/servoblaster" to read back the current settings. This is intended primarily as a debug feature, as it'll let you confirm that the driver is really seeing commands you think you are sending. It does also let you capture all servo positions (via "cat /dev/servoblaster > some.file") and later restore them (via "cat some.file > /dev/servoblaster"). You can now do "make install" which will create the udev rules so that later you can just do "sudo insmod servoblaster.ko" and /dev/servoblaster should be created for you automatically. You can do "make install_autostart" which will arrange for the module to be loaded and /dev/servoblaster created automatically on subsequent reboots. Use this with care, as it means the eight GPIO pins will be reconfigured as outputs on every reboot in future (not a good idea if you might have other hardware driving them sometimes). You can disable the autoloading of the module later by removing the relevant line from /etc/modules. This works on Raspbian, at least. Finally, the driver now copes with you sending multiple commands in one write (e.g. echo -ne "0=100\n1=200\n2=150\n" > /dev/servoblaster). Thanks go to Robin for most of this work. I have the same problem with /dev/servoblaster file (no such file after loading module), like "Smcintosh" had (on page2). I installed latest kernel and servoblaster versions. I've got the same problem two days ago (on previous servoblaster version), and now (new version). You can see in the example output above that servo output 2 goes high at time 0, then low at 999us, then high at 19999us, low at 20999us, etc. That means the output is on for approximately 1ms in every 20ms, as expected for a command of "2=100". I'm interested to see your output. Does it even get as far as showing a list of transition times, or does it error before that? Does the pattern repeat every 20ms for you, or is it running at a different speed for some reason? Does it run at a consistent speed for you, or does the pattern repeat at irregular intervals? If it is running at the wrong speed consistently, there are a couple of module parameters you can try to adjust that, see the README for details. This debug code can be disturbed by interrupt processing or scheduling, so you might get the occasional odd result, but if you run it a few times it should give fairly consistent results. The GPIO pins are obviously configured as outputs by servoblaster; this debug code reads the GPIO level input register to report what is actually driven on to the pins by servoblaster. @box, Thanks... that didn't help much did it. So apparently your servo output is doing exactly what it should. You are using servo 7, which is GPIO 25, which is on P1 pin 22. If you use a separate power source for your servo, the 0v of that source should be tied to the 0v (GND) on the Pi. I don't know what servo you are using, but I am assuming you are providing it with sufficient power, and that it is happy with a control signal that switches between 0v and 3v, or there abouts. If you have extra electronics between P1-22 and the servo control input to buffer the signal I assume that circuit is not inverting the control (which would give you a 19ms pulse from the servo's point of view, which is invalid). Here's another test you can do if you have a multimeter. I set mine to measure DC voltage and measured the voltage on P1-22. If I "echo 7=0 > /dev/servoblaster" I measure 0v, "7=125" gives me about 0.2v, "7=249" gives me about 0.4v. That seems reasonable because 249 is 2.49ms, which is one eighth of 20ms, and 0.4v is about one eighth of 3.3v (the GPIO high level). You should do this first with no servo connected, and then again with the servo connected, in case the servo is somehow overloading the GPIO output. I did this with a cheap meter that cost about £7; it's possible others might not average a pulsing signal in the same way. Of course, if you have an oscilloscope you can use that to check the pulses, or if you have a second Pi you could use Panalyzer on that to monitor the first Pi. Another idea would be to make my debug code set up another GPIO pin as an input and monitor that one, then you could link it to P1-22 and be sure you were genuinely monitoring the control signal that was being sent to the servo. Finally, when you say it doesn't work, what actually happens if you "echo 7=100" and then "echo 7=200"? Does the servo not move at all? Does it twitch a bit? Now it is working. My mistake. I used pin25 instead of GPIO25 (pin22). ... to avoid many mistakes and questions. @box, yeah, with three different ways to number gpio pins there is plenty of scope for confusion I'll update the README. I noticed the code in servoblaster that configured the PWM clock was unreliable - if I repeatedly unloaded and reloaded the driver it didn't always start up properly, and if I played some PWM audio before loading servoblaster, then servoblaster rarely worked. I've made some changes and uploaded a new module, which is more robust. ServoBlaster currently uses the PWM hardware for timing purposes, so cannot be used at the same time as PWM audio on the 3.5mm jack, and if you play PWM audio after loading servoblaster.ko, you'll need to unload and reload servoblaster.ko in order to recover. I should perhaps investigate using some other hardware for timing purposes (such as PCM, maybe), which is less likely to cause a conflict. Ummm, the timing is generated in hardware (via the DMA controller, and using the PWM FIFO clock to generate delays); why would PREEMPT_RT have any impact at all on that? The code does disable interrupts, but only so it can adjust multiple DMA control blocks in a well defined time window. it working after updating the kernel. It got a a 74HC541 to make the 3.3V-signal 5V. It also protects the RPi from the servos/ESC and the servos can be powered via ESC or RPI, and RPI can be powered via micro-usb or ESC. Since i had some room on the PCB i broke out the serial port.